Halo-halo (from Tagalog word halò, "mix") is a popular Filipino dessert that is a mixture of shaved ice and milk to which are added various boiled sweet beans and fruits, and served cold in a tall glass or bowl. Left: A bowl of Halo-halo. There is no specific recipe for this dessert, and a wide variety of ingredients are used. The order in which the ingredients are added varies widely. Primary ingredients generally include boiled red mung beans, kidney beans, garbanzos (chickpea), sugar palm fruit, coconut sport, and plantains caramelized in sugar. Other components may include jackfruit, star apple, tapioca (a starch extracted from the root of the plant species Manihot esculenta) or sago (a starch extracted from the pith of sago palm stems, Metroxylon sagu), nata de coco, purple yam or sweet potato, sweetened corn kernels or pounded crushed young rice, leche flan or custard, ice cream and gelatin. Other fruits, such as papayas, avocados, kiwifruit, bananas or cherries, may also be added. Some preparations also include ice cream on top of the halo-halo. Generally, condensed milk or evaporated milk is used instead of fresh milk, due to the tropical climate of the Philippines. In terms of arrangement, most of the ingredients (fruits, beans, and other sweets) are first placed inside the tall glass, followed by the shaved ice. This is then sprinkled with sugar, and topped with either (or a combination of) leche flan, ube halaya, or ice cream. Condensed or evaporated milk is poured into the mixture upon serving. 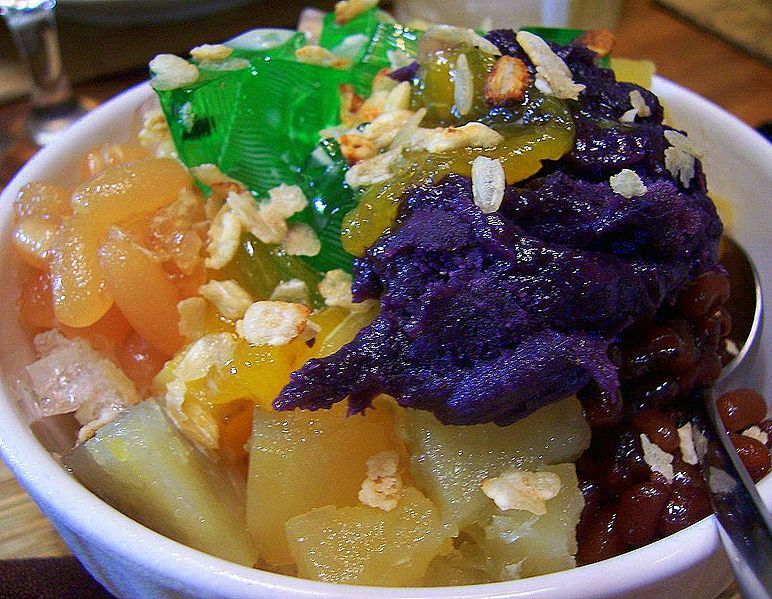 The dessert exemplifies the "east-meets-west" culture in the Philippines, with the ingredients used coming from a wide variety of influences (to cite some examples: red mung beans which are from the Chinese, garbanzos from the Indians, leche flan from the Spaniards, and shaved ice itself, which was introduced to the islands by the Americans).